Apple for the Teacher Award. Hayley Simpson of Snug Primary School must be an exceptional teacher. Not only has she won the Apple for the Teacher Award but she chose to sell the prize of an Apple I pod/watch to enable her class to come to the Cascades Female Factory to learn all about convict women through some activities and to experience the drama Her Story. As it happened, it wasn’t necessary because 7 HO FM heard about it and offered to pay for the excursion! The students attended today and thoroughly enjoyed the experience. 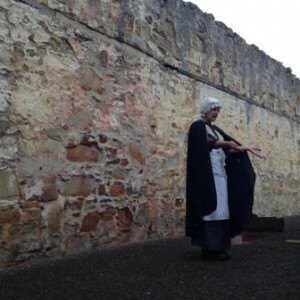 Thanks to Hayley they now know so much about female convict life via the teaching skills of Anton and Esther and the performance skills of Chris and Judith at Live History Plays. Thank you too to 7 HO FM! Snug Students on Her Story. The weather has been a bit challenging for us at Live History Plays this week. Why is it that as soon as the calendar says it’s Spring the weather turns more wintry than ever? It started to pour yesterday just as we started Her Story and didn’t let up until we had finished. We made a quick decision and decided to take our audience (including a tiny baby and a toddler) upstairs under the cover. Everyone was so grateful!!! Overseer Lovell – any Information? It’s been a busy week for us at Live History Plays with extra groups and schools. 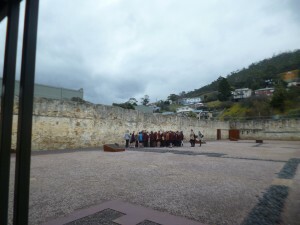 Alamanda College from Victoria brought x 2 groups and Invermay Primary School brought another . One student from Invermay told us that she had researched one of her ancestors and that he had worked as an Overseer on site but had been sacked for “being too kind to the pregnant women” . His name was Lovell – can anyone shed any more light on this? 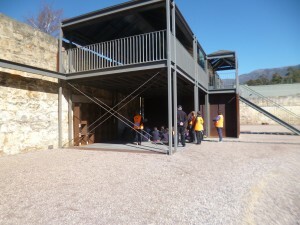 Do you like the new sign board created by Port Arthur Historic Site Management Authority? It’s to help keep people, who haven’t paid the $20 ticket price to experience Her Story, at a distance! The year is 1847. Anchored at the wharf of Sydney Harbour and prepared for sailing to Hobart is the small square-rigger Louisa. 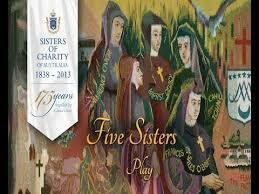 On board are three Sisters of Charity. They arrive in Hobart Town six days later. 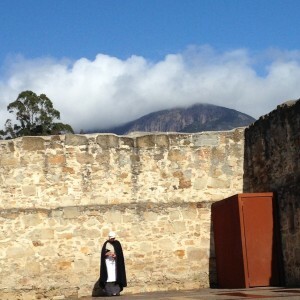 So begins the work of the Sisters in Tasmania. 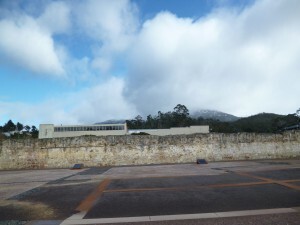 Eventually housed in the Convent behind St Joseph’s Church in Macquarie Street those early Sisters would walk up to the Cascades Female Factory along the Rivulet track to minister to the convict women. Nowadays the Sisters of Charity maintain a presence at the Female Factory by visiting the site in memory of those early pioneer women. Live History are privileged to take this diverse group representing all aspects of the organisation’s work (and including many men) on Her Story. 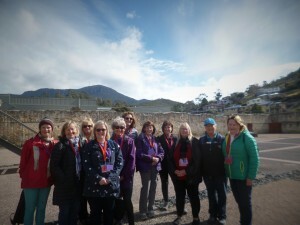 Robyn Everist of Hobart Walking Tours brought a lovely group of women on Her Story today. 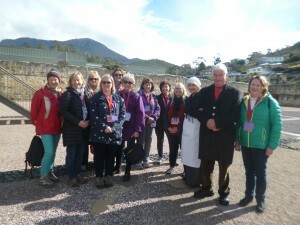 All friends and keen walkers they had decided to put themselves into Robyn’s capable hands and get her to organise a walking tour tailored just for them Most of them had never visited the Cascades Female Factory or experienced Her Story before. What a good idea! But why is that we locals don’t usually visit the tourism things on our own doorstep? Why not copy their idea and get Robyn to design your own special walking tour she does it so well and is a mine of local information, you will learn so much about your own lovely city…..? Robyn Everist Accompanies Her Group on Her Story. 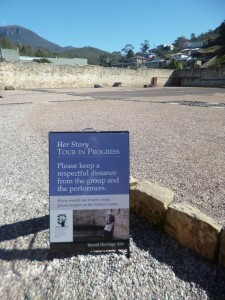 Hobart Walking Tours on Her Story. It was a chilly start as Live History Plays took Somerset College on our dramatic experience at the Cascades Female Factory this morning. 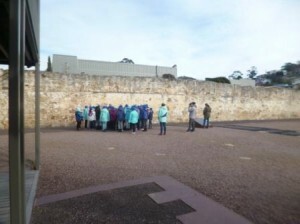 The Grade Six students, who come down, from the Gold Coast for a winter camp every year to experience our winter cold and history, were well rugged up. We took the girls first and then the boys and both were equally engaged. Somerset College have been coming down to visit us at Live History Hobart for, at least, the last 10 years; firstly on Louisa’s Walk and now on Her Story. Each year they wear a different coloured beanie so teachers can keep track of them – this year it was blue! As ever the kids were totally absorbed and asked many insightful questions afterwards. Kids LOVE learning about history in this way!! We are closing Her Story on Tuesdays and Wednesdays over winter – June to August inclusive. The first 2 weeks of August will be entirely closed to give us our annual break. Visitor numbers to the lovely city of Hobart do drop considerably over winter. although the advent of our winter festivals particularly Dark Mofo and Festival of Voices helps to boost numbers again. A Wintry Landscape as Mary's Backdrop. winter conditions add to the drama on every level! Come and hear the tale of Mary James on a cold, frosty day and re-live her harrowing life. You will be amazed! Winter Rates for our Self Contained Holiday Cottage! Our Super Special Winter Rates for our self-contained Holiday Cottage in beautiful Blackmans Bay have got off to a good start today! Last minute guests through Booking.com arrived at 7 pm tonight. 19 Blue is only 15 minutes from Hobart’s CBD so it makes an ideal place to stay. Why not take advantage of these competitive rates – at jut $99 per night or $500 per week and treat yourselves to a few nights away? 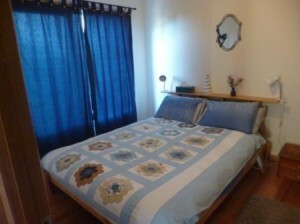 Lovely country furnishings, home bread for breakfast and a lovely beach just ten minute’s walk away. With Dark Mofo and Festival of Voices just around the corner you had better book quickly! We have been moved to tears many times at the Cascades Female Factory as we recount Mary’s tale on Her Story but never more so than today. Amongst our group of 18 was an elderly lady. She came up to me at the end, after we have come out of character and we are bidding people farewell. She said ” I was one of those strong women – I was at Auschwitz – this brought it all back”. I cried as I hugged her. The Sheep’s Back at Henry Jones. 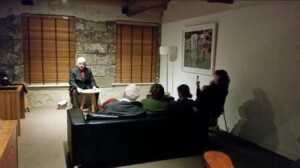 Live History performed a command performance of our forty five minute show The Sheep’s Back at a private apartment at Henry Jones Art Hotel today. We had been asked to do this to help celebrate a 64th wedding anniversary; a unique gift from the family. What a wonderful idea to give an experience instead of material presents! 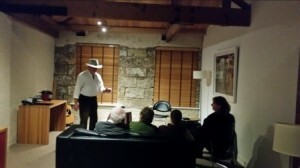 With its backdrop of stone walls the apartment made a very appropriate setting for the show which profiles the life of a shearer and his wife in the year 1895.